This week PBS stations around the country will broadcast the final segment of Moyers & Company, Bill Moyers' provocative, groundbreaking interview show. Moyers, who came to PBS in 1971, is retiring the show, but not retiring from the world of public affairs. He will continue to write, speak out, and produce his remarkable website, filled each day with insightful articles by Bill and others about dangers to our democracy and battles for social justice. But the end of Moyers' regular presence on television will leave a huge hole in America's broadcast landscape. 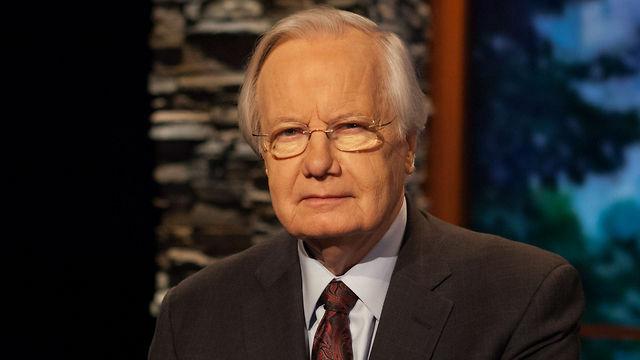 No other program has journalistic breadth and depth, as well as the progressive viewpoint, that Moyers' show has provided views for over four decades. Will PBS -- which has been under increasing pressure from Congress and funders to move to the right -- even try to fill that gap? Moyers, who turned 80 in June, has been one of the most prolific and influential figures in American journalism. Not content just to diagnose and document corporate and political malpractice, Moyers has regularly taken his cameras and microphones to cities and towns where unions, community organizations, environmental groups, tenants rights activists, and others were waging grassroots campaigns for change. Moyers has given them a voice. He has used TV as a tool to expose political and corporate wrongdoing and to tell stories about ordinary people working together for justice. He has introduced America to great thinkers, activists, and everyday heroes typically ignored by mainstream media. He has produced dozens of hard-hitting investigative documentaries uncovering corporate abuse of workers and consumers, the corrupting influence of money in politics, the dangers of the Religious Right, conservatives' attacks on scientists over global warming, and many other topics. A gifted storyteller, Moyers' TV shows, speeches, and magazine articles have roared with a combination of outrage and decency, exposing abuse and celebrating the country's history of activism. Moyers' website offers full streaming video and podcasts of Moyers & Company, online-only essays, analytical blogs, interactive features, as well as an extensive video library of Moyers' past work. There you can browse and view hundreds of Moyers' programs covering a wide range of topics including the economy, faith and reason, money and politics, war, media, and the arts. Moyers has spent most of his broadcast career on public television, whose audience is considerably smaller than that of the major networks. But his influence -- through his documentaries, interviews, books, magazine articles, and speeches, and because of the ripple effects of his calls to conscience -- has been great nonetheless. He has received over 35 Emmy Awards (including a Lifetime Emmy), a lifetime Peabody Award, an Alfred I. DuPont-Columbia University award, a George Polk Career Award (his third Polk award), induction into the Television Hall of Fame, and many other honors for his contributions to journalistic integrity and investigative reporting. His wife, Judith Davidson Moyers, has been his partner in many of his journalistic endeavors as well as a committed activist and public servant on her own. Moyers assembled a remarkable team of writers and producers who have helped him create his show, taped at the City University of New York television station's HDTV studio in midtown Manhattan. "The most encouraging sign is that 71 percent of the public believe the system is profoundly corrupted by the power of money. Ninety-six percent of the people believe it's "important" that we reduce the influence of money. Yet 91 percent think it's "not likely" that its influence will be lessened. Think about that: People know what's right to do yet don't think it can or will be done. When the public loses faith in democracy's ability to solve the problems it has created for itself, the game's almost over. And I think we are this close to losing democracy to the mercenary class." "What today's activists--the low-wage workers fighting Walmart, the immigrant rights activists, the Moral Monday activists in North Carolina, those fast-food workers who have stirred admiration and collegiality among serfs at large, and many more--have in common is a conviction once expressed by Robert La Follette: 'Democracy is a life, and requires daily struggle.'" Moyers comes by his progressive class-consciousness and moral outrage naturally. Neither of his parents went to high school. Dirt-poor, they worked as farmers until they could not make it anymore because of bad weather and the boll weevil. When Moyers was born, the family lived in southeast Oklahoma, where his father was making $2 a day working on highway construction. When he got a job driving a creamery truck, they moved to Marshall, Texas. "The Great Depression knocked him down and almost out, and he struggled on one pittance paying job after another, until finally, late in life, he had a crack at a union job. His last paycheck was the most he'd ever taken home in a week, $96 and change, and he was proud of it. I saw then how unions struggled to preserve the middle class, and can make the difference between earning a living wage and being part of the working poor." Moyers and his older brother went to Sunday school at Central Baptist Church, where, as he recalled, "we didn't have baseball cards; we had Bible cards depicting scenes from the scriptures." 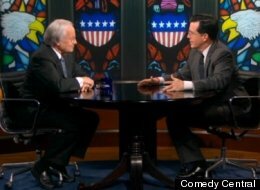 I asked Moyers what role his religious faith has played in shaping his political views and journalism. "When I was growing up, I never heard anyone pray, 'Give me this day my daily bread.' It was always, 'Give us this day our daily bread.' That stuck. We're all in this together. I take 'We, the People' seriously because I don't know how we build a civilization without reciprocity. There's a moral contract in that Preamble. And although I was brought up in a culturally and religious conservative culture, as a Baptist I was taught that no one has the right to subpoena your conscience." On his sixteenth birthday, Moyers went to work for the local paper, the Marshall News Messenger. One of his first stories was the "Housewives' Rebellion," about a group of fifteen women who refused to pay Social Security taxes for their maids because they believed that the insurance program was unconstitutional. Their lawyer -- former right-wing Congressman Martin Dies Jr.-- lost the case. Moyers was thrilled when the Associated Press picked up the story. Only later did it dawn on him that that the newspaper never covered stories about Marshall's African Americans, who made up half the town's population. "For all practical purposes the staff of the paper pretended half of Marshall didn't exist," he later wrote. 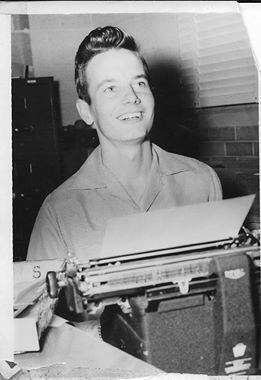 Moyers left Marshall in 1954 to attend North Texas State College (now University of North Texas). He spent a summer interning on then-senator Lyndon B. Johnson's reelection campaign. Impressed with the young Moyers, LBJ suggested that he transfer to the University of Texas in Austin. There he majored in journalism and the liberal arts while working full-time as assistant news editor for KTBC-TV for $100 a week. Graduating in 1956, he studied theology at the University of Edinburgh in Scotland and at Southwestern Baptist Theological Seminary, where as the weekend pastor of two small rural churches he inflicted "amateurish wisdom on very patient and loving congregations of mostly farmers and their spouses," as he told NPR's Terry Gross in a 1996 interview. In 1959, he moved to Washington, DC, to work for Johnson. He helped run LBJ's 1960 vice presidential campaign as John F. Kennedy's running mate. Moyers was a founding organizer of the Peace Corps in 1961 and was appointed its deputy director by President Kennedy. 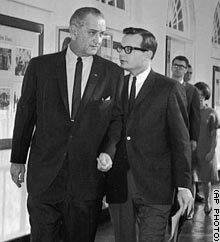 After Kennedy was assassinated, LBJ brought Moyers to the White House as his assistant for domestic policy with responsibility for shepherding the task forces that led to LBJ's Great Society program. Moyers played a key role in helping LBJ pass the Civil Rights Act of 1964 and the Voting Rights Act of 1965. He was with LBJ when the president met with Martin Luther King Jr. at the White House and tried to convince the civil rights leader to call off further protests, arguing that they would harden white resistance and make it impossible for him to win over southern senators and representatives, with whom Johnson had often successfully negotiated as Senate majority leader. King disagreed, reminding LBJ of the history of murders, lynchings, and humiliation, insisting that the protests were necessary to draw attention to the need for civil rights legislation. As Moyers recalled: "LBJ listened, as intently as I ever saw him listen. He listened, and then he put his hand on Martin Luther King's shoulder, and said, in effect: 'OK. You go out there Dr. King and keep doing what you're doing, and make it possible for me to do the right thing.'" 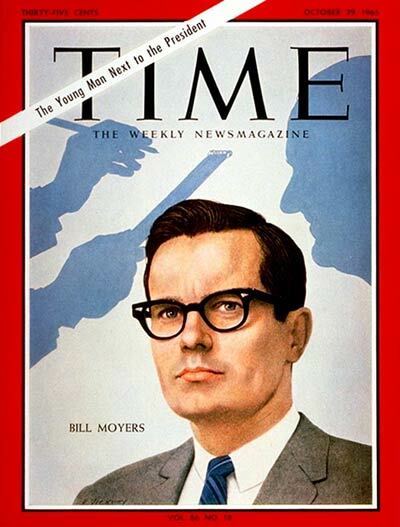 TIME magazine put Moyers on its October 29, 1965 cover, under the headline: "L.B.J. 's Young Man In Charge of Everything." By 1966 Moyers had reluctantly agreed to be the president's press secretary, but he found it increasingly difficult to defend LBJ's escalation of the war in Vietnam. "The things I really cared about--poverty, the Great Society, civil rights--were all being drained away by the war," he recalled. "The line that keeps running through my mind is the line I never spoke: 'I can't speak for a war that I believe is immoral.'" Moyers resigned from the White House in 1967 and became the publisher of Newsday, a daily newspaper that primarily served New York's Long Island suburbs. "When I left the White House I had to learn that what matters in journalism is not how close you are to power, but how close you are to the truth," he said. With Moyers at the helm, Newsday expanded its news agenda, recruited a wide range of writers, and won many major journalism awards. But Harry Guggenheim, Newsday's conservative owner, disapproved of the paper's liberal innovations under Moyers, particularly what he called its "left-wing" coverage of the antiwar movement. In 1968 Guggenheim signed an editorial supporting Richard Nixon's presidential candidacy, while Moyers published his support of Hubert Humphrey. Moyers resigned in 1970 and took a 13,000-mile bus trip around the country, armed with a notepad and tape recorder, interviewing people for his best-selling book Listening to America: A Traveler Rediscovers His Country. The following year, he began his long relationship with public television, interrupted by a decade (1976-1986) at CBS News. In order to maintain his journalistic independence, Moyers formed his own production company and raised all the funds for his many productions. At PBS, Moyers, a master of the long interview, has had the freedom to craft his own programs, including Now with Bill Moyers, Moyers on America, Bill Moyers Journal, and Moyers & Company, which began in 2012. He has interviewed important thinkers and activists rarely seen on television, including organizers like Ernesto Cortés, Sarita Gupta, Madeline Janis, Bill McKibben, and Ai Jen Poo, historians like Howard Zinn, Diane Ravitch, and Harvey Kaye, scientists like René Dubos, philosophers like Joseph Campbell, theologians like Karen Armstrong, artists like Ruby Dee, Pete Seeger, Maya Angelou, and Tom Morello, economists like Joseph Stiglitz, provocative writers such as Ta-Nehisi Coates, Wendell Berry, Michelle Alexander, and Naomi Klein, and progressive politicians like Senator Bernie Sanders and Gayle McLaughlin, the feisty mayor of Richmond, California. Moyers has produced investigative documentaries on a wide variety of topics, including the cost of the Iraq and Afghanistan wars on local communities, campaign finance, inadequate funding for public schools, the rise of the Religious Right, global warming, the dumping of hazardous waste, and, in Trade Secrets, the chemical industry's poisoning of American workers and communities. Moyers' 11-part mini-series documentary in 1987, In Search of the Constitution, celebrated the document's bicentennial, examined its use and abuse by political leaders, and included interviews with sitting Supreme Court justices and prominent legal scholars. "The [chemical] industry somehow purloined a copy of our draft script and mounted a sophisticated and expensive campaign to discredit our broadcast before it aired. A Washington Post columnist took a dig at the broadcast on the morning of the day it aired--without even having seen it--and later confessed to me that the dirt had been supplied by a top lobbyist for the chemical industry." In addition, the American Cancer Society distributed talking points to columnists and other opinion makers that were written by Porter Novelli, a public relations firm that also had several chemical companies as clients. Later that year, the documentary, In Our Children's Food, won an Emmy for investigative journalism. But the experience was one more reminder to Moyers of the corrosive effect of corporate power on the common good. Moyers's 2007 documentary Buying the War reported how most of the press corps became complicit with the Bush administration's invasion of Iraq. "If the watchdog doesn't bark," Moyers said about the show, "how do you know there's a burglar in the basement? And the press is supposed to be a watchdog." "Can we put aside that old canard spouted by Wall Street apologists every time someone calls for greater equity between working people and the rich? Truth is, there's been a class war waged in America for thirty years now from the top down, and the rich have won." Moyers interviewed Glenn Greenwald, then a blogger at Salon, about government secrecy and other topics in 2009, years before Greenwald became a household name as a result of his reports exposing United States and British surveillance program based on classified documents disclosed by Edward Snowden. The Nation called Moyers "the most radical presence on broadcast and cable television" but also pointed out that, to generate lively debate, he has consistently invited conservative thinkers onto his show, including Richard Viguerie, Cal Thomas, and Ron Paul. Moyers has often used his power as a broadcast journalist to uncover the unseemly entanglement of big business and politicians. "If a baseball player stepping up to home plate were to lean over and hand the umpire a wad of bills before the pitch, we would know what that was: a bribe. But when the tobacco industry stuffs $13 million in the pockets of the merry looters in Congress and gets protection in return, we call that a campaign contribution." Four years ago, in collaboration with the Center for Media and Democracy, Moyers exposed the inner workings of the American Legislative Exchange Council (ALEC), a corporate front-group that promotes state-level legislation deigned to increase corporate profits at public expense without public knowledge. In a broadcast about the concentration of media ownership, he pointed to "the paradox of Rush Limbaugh, ensconced in a Palm Beach mansion massaging the resentments across the country of white-knuckled wage earners, who are barely making ends meet in no small part because of the corporate and ideological forces for whom Rush has been a hero." Moyers admires what he called the "Mount Rushmore of muckraking" journalism, including Lincoln Steffens, Ida Tarbell, Upton Sinclair, and I. F. Stone. But if he could be anyone today, Moyers said, it would be Ambrose Bierce. "Dennis Drabelle's new book, The Great American Railroad War: How Ambrose Bierce and Frank Norris Took on the Notorious Central Pacific Railroad, is a thriller about how Bierce was hired by William Randolph Hearst to take a swat team of reporters and editors to Washington to stop the very rich and ruthless Collis Huntington, the railroad baron, from bribing Congress and passing on to taxpayers the big loan he had obtained from the government. They beat him just as he was about to buy the last man. Oh, for that kind of impact today!" Asked about the contemporary investigative journalists he admires, Moyers pointed to reporters on the New York Times, at McClatchy newspapers, ProPublica, the Center for Public Integrity, the Center for Investigative Reporting, and Mother Jones, as well as young independent writers Andy Kroll and Lee Fang. He also mentioned several muckraking films, including Michael Moore's Sicko and Capitalism: A Love Story, Charles Ferguson's Inside Job, and Alex Gibney's Taxi to the Dark Side. "All of these people share the conviction that news is what's hidden. Everything else is publicity," Moyers explained. Moyers suggested that "the most important thing the giant philanthropies could do -- Gates, Rockefeller, Ford, Open Society Institute, and new ones emerging -- would be to create a $2-to-$3 billion Trust for Independent Journalism. They wouldn't miss the money, and democracy would still have a fighting chance because of their investment."